Western New Yorkers are blessed with an incredible number of public assets -- from town parks to state forests – that allow locals and tourists alike to explore the Niagara Frontier and enjoy the great outdoors. One of those assets is, for the most part, lightly used especially given its accessibility to some of our major population centers. That outdoor destination would be the Erie Canalway Trail. The trail was once commonly known as the “towpath” (many of us still call it that to this day) because back in the Canal’s heydays of the 1800s it was walked by the mules and horses that pulled packet boats and barges down the waterway. Maybe it’s that original utilitarian purpose that keeps people away. Maybe it’s the misbelief that it’s not interesting enough. Maybe it’s the fact that it’s everywhere and everyday – something we pass over on our commutes and overlook because it’s just “there”. Whatever the reasons may be, I strongly encourage my readers to cast those misconceptions aside and appreciate the hundreds of miles of trail awaiting our sneakers, hiking shoes, baby strollers, bicycles, and skis. The Erie Canalway Trail is a great place to be. In the coming months and years this column will periodically look at stretches of the trail, giving you insight into the local history and natural history. The towpath is an asset – it should be used as such. 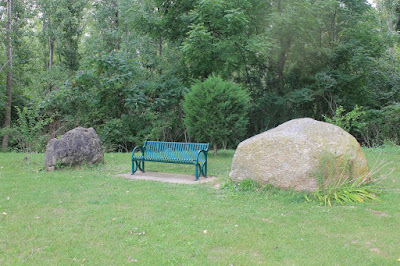 We will begin the series by looking at the trail as it heads from the Orangeport Road bridge in Gasport to the Canal Road bridge in the town of Lockport. This is my favorite part of the Canal trail for various reasons – it’s very close to home, I can see our farm from the trail, and it’s quiet. I routinely take my 1 year-old son on stroller rides on this stretch. It’s a good hike, too – round-trip from the Orangeport parking lot it’s a good 4 miles. Moving at a fair pace, a hiker can accomplish the hike in an hour and 15 minutes. It will take much longer if you stop to rest, fish, or watch the wildlife. All such opportunities abound on this stretch. Getting there is easy. Most people reading this column will make their way to Gasport on Route 31. Just to the west of the hamlet is Orangeport Road, which is across the street from Gasport Auto Sales. With a few hundred feet of getting onto Orangeport Road, you will cross over the Erie Canal. Once you do, keep your eyes open, quickly approaching on your right will be Berner Parkway. Take Berner all the way to its end. The turnaround there is the parking lot for the trail. That lot is spacious and can hold about 10 cars. For most of my hikes, there will be just 1 or 2 other cars there. This lot actually used to be where the old Orangeport Road bridge once stood (Berner Parkway was originally Orangeport Road) prior to its reconstruction in 1993. It’s called Orangeport because back in the 1800s there once stood an inn that was frequented by canal boatmen – it was painted a bright orange as a means to attract attention and imbed the hotel in your memory. Upon walking out of the lot, walk towards the bridge and continue heading in that direction. This portion of the trail is impeccable. It is perfectly groomed by the Canal Corporation, and is made of stone dust. There are no potholes and no large stones that will twist an ankle. You can walk, run, bike, or push a stroller with ease. It’s truly friendly to all types of use. For the next two miles, you will be graced with nothing but pastoral scenes to the north. The closest road is Slayton Settlement Road, which is a full mile away, so you won’t encounter any houses on the trail side of the Canal until you get to the Canal Road bridge. That means you’re exposed to apple orchards, small forests, and literally thousands of acres of corn, alfalfa, and wheat. It’s scenic, especially when the wheat is golden or the crops are full or the leaves have changed color for the fall. The lack of civilization also means that the trail puts you close to wildlife. It’s not uncommon after sunrise and before sunset to see dozens of deer or turkeys coming out of the woodlots to graze. During the late-summer and fall, avian fish mongers love this stretch. Kingfishers scoop the water for minnows, green herons creep along the rocky shore, cormorants dive for rock bass, and ospreys plunge into the depths for carp and bass. The ospreys are certainly the most spectacular of the bunch. This once endangered bird of prey is making a sort of comeback and a welcome one at that. It’s pretty neat to watch one hover 50 to 100 feet over the Canal and dive in from that height to secure dinner. 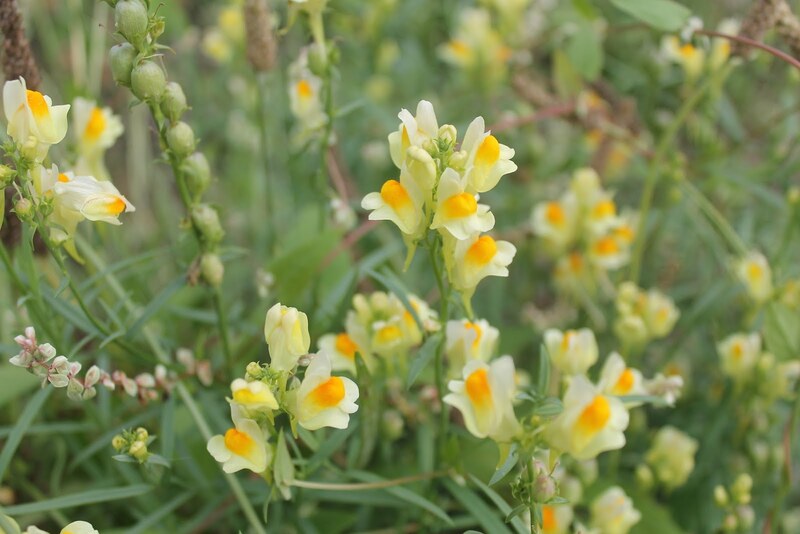 You should also enjoy the wildflowers along the path, especially in late-summer and fall. Many people derisively look at late-season flowers as weeds. They are not. The whole palette of colors is there, as you can see hawkweed, touch-me-nots, morning glories, chicory, and butter and eggs to name a few. Along the trail you will see 3 different streams that get their water from PVC pipes that run from the Canal. The whirlpool action is so drastic in the Canal at times that you can hear these pipes from a great distance. The purpose of this water collection is to keep the streams flowing so farmers can use the water to irrigate their crops. The fourth creek, labeled “118” on the sign in front of it, doesn’t get Canal water, flows under the Canal, and has a wooden fence high above its culvert. This creek is one of the more interesting in the region. Far into the woods (which is private property) the creek bubbles with natural gas, which is the reason why Jamesport was renamed Gaport in 1826. For good reason, it caught the attention of engineers and scientists during the Canal’s construction -- and it still does to this day as scientists from around the world take samples of the gas. Across from that creek, houses begin to show up on the south side of the Erie Canal. The first one might look familiar to many people. Prior to the late-1990s it used to be Camp Margaret Castle, a camp that was owned and used by the local Girl Scouts who also rented it out to Boy Scouts for their spring and fall camporees. A lot of memories were made there for a lot of campers. Approximately 400 feet past creek 118 you will come to a wonderful picnic spot. McCollum Farms allows the Canal Corporation to use the canal frontage of their land as a rest stop and as a 500-ft. long stretch of green space that is mowed by the Corporation. At the start of that grassy area are some boulders and an iron bench. This is where you want to stop and enjoy a drink or a picnic lunch (just carry out everything you carry in). Further down the trail you will come upon the Canal Road bridge. 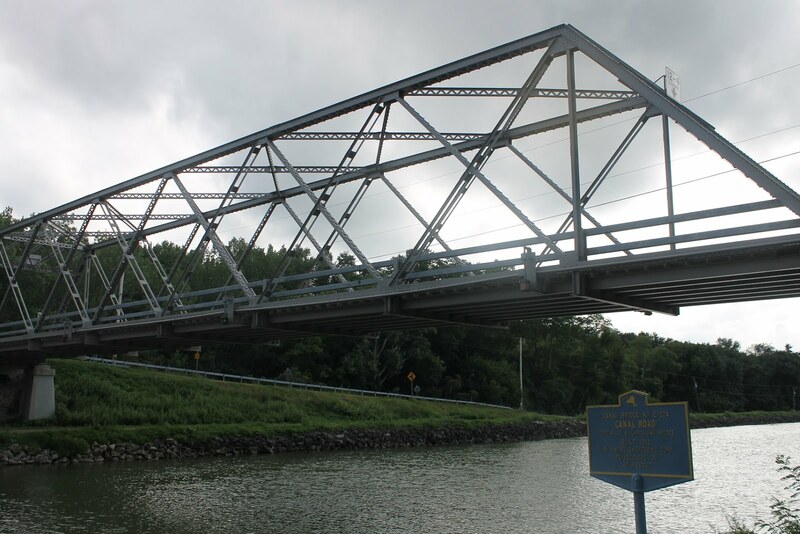 This single-lane steel bridge was built in 1900 and is still in great shape today. This is where many hikers (yours truly included) turn around and head back to Orangeport. Not only is this section of the Canal great for exercisers and nature lovers, but fishermen will enjoy it, too. Don’t overlook the Erie Canal as being fishy water. Wait till July once the fish populations get back to normal after the spring filling. Then, you have until November to cast spinners, crankbaits, and Mr. Twister’s for bass, walleye, and pike. Fishing is best in the early and late hours. This portion of the trail is accessible all year, so don’t think that your explorations end when the flakes fly. If you are into cross-country skiing or snowshoeing, you will like that the Berner Parkway lot is kept open as town snowplows use it as their turnaround. 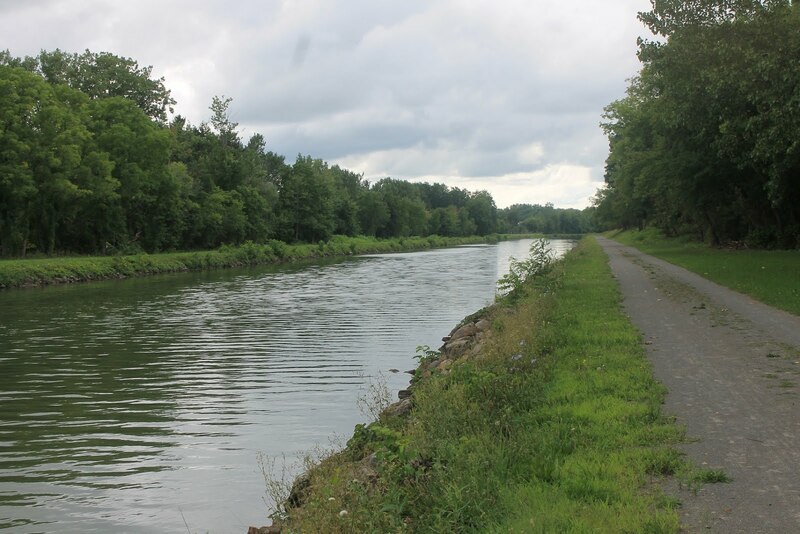 Make it a point to hike the Erie Canal’s towpath this fall. You might find yourself appreciating this underappreciated trail system, especially along this quiet, rural stretch.